Particulates in an instrument carrier gas stream can reduce the overall performance of laboratory analytical work. Removing particles can reduce background noise levels and enhance instrument accuracy and precision. The capability of these filters to remove bacteria and other particulate matter enables pharmaceutical manufacturers to install a filter in gas lines to those systems requiring process, purge, or blanket gases, thus ensuring a virtually sterile gas atmosphere. Because of the small orifices normally associated with these devices, they often malfunction and require frequent servicing. Installation of a particulate filter in the air or nitrogen feed lines helps to ensure longer trouble free operation, thus reducing down-time. With increasing levels of device density the effect of particulate contamination becomes more damaging to potential yields. 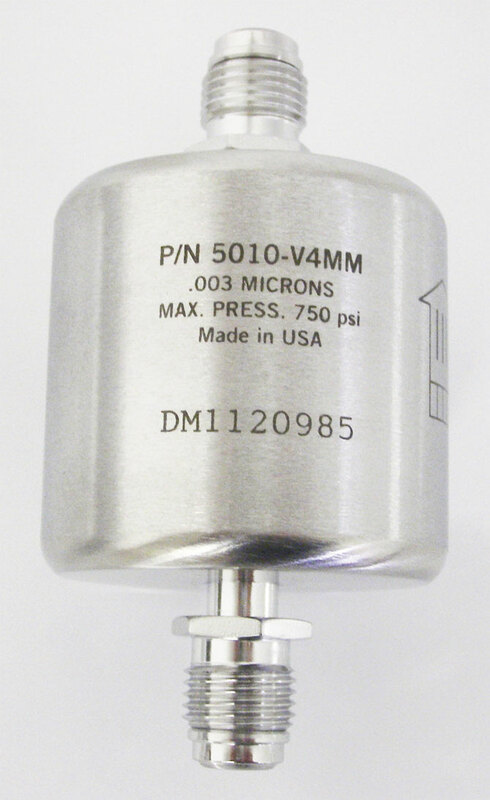 Semiconductor manufacturers install these filters in virtually all their gas lines to reduce the effects of particulates and improve their production yields. The Teflon® medium in this filter efficiently traps particles down to 0.003 microns. These units may be installed in gas lines supplied by cylinders or bulk sources. Both the materials and manner of construction render the Series 5010 units compatible with a wide variety of gases. 99.9999999% efficient at 0.003 micron level. Filter medium - porous PTFE Teflon® membrane. All welded 316L stainless steel construction. Internal finish - less than 10 Ra. 0.5 sq. ft. filter area provides high particle retention capacity. Excellent compatibility with a wide variety of gases. Helium leak tested to 1 x 10-9 cc/sec. Max. Operating Pressure: 250 psig @ 250°F. **Other end fitting configurations available on request.